NILES, Ill., November 8, 2016—The 50th Country Music Association Awards were broadcast live on ABC from a sold-out Bridgestone Arena in Nashville on Wednesday, November 2. Hosted for the ninth straight year by country stars Brad Paisley and Carrie Underwood, Country Music’s Biggest Night™ showcased the best in country music with a series of outstanding performances, heavy on tributes and collaborations. In a fitting coincidence, most of the show’s live performances used the Shure SM58 vocal microphone, which is also celebrating its 50th year of service and support to the music community. The night began with a star-studded production number, with country music royalty performing a medley of classic hits to lead off the show. Shure UR2 wireless transmitters were prevalent across the stage. After Vince Gill started the show on a KSM9 transmitter, it was SM58 microphones powering performances by Brad Paisley, Alan Jackson, Charlie Daniels, Roy Clark, Charley Pride, Clint Black, Ricky Skaggs, and all three members of Alabama. The UR2/SM58 combination was also the choice for performances by Shure endorsers Luke Bryan, Martina McBride, Kacey Musgraves, Kelsea Ballerini, and Maren Morris; plus the duet with Dierks Bentley and Elle King. Other performers opting for the SM58 included Male Vocalist Award winner Chris Stapleton on the classic hardwired mic, plus Tim McGraw and Keith Urban on UHF-R® wireless. Another highlight of the show was Entertainer of the Year winner Garth Brooks. Using the UR2/SM58, Brooks performed a stunning duet with his wife, Trisha Yearwood, who came equipped with her own Shure Axient® wireless systems, including multiple customized AXT200 transmitters–all with SM58 heads. 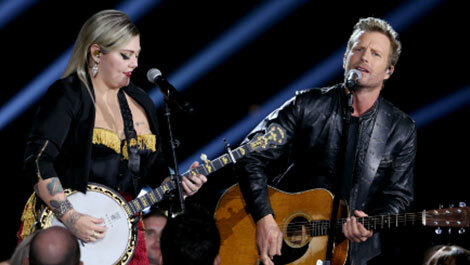 A veteran audio crew was on hand to provide the CMA Awards with superb sound. Audio Producer Tom Davis was assisted by Audio Coordinator Kevin Sanford. The final broadcast production mix for ABC was performed by J. Mark King. The broadcast music mixes were done in full surround by Music Mix Mobile trucks, with engineers Jay Vicari and John Harris at the consoles. At front of house, Rick Shimer created the music mix, while Pat Baltzell handled the production mix for the packed house of attendees. Monitor mixing was another Shure affair, with PSM®1000 in-ear wireless systems delivering mixes from engineers Jason Spence and Tom Pesa. ATK Audiotek was the primary backline supplier, including all Shure UHF-R and PSM 1000 systems. Stoffo was also impressed with how smoothly the Shure systems added to the custom transmitters brought in by several artists. “We always have a host of artist ‘bling’ microphones sharing frequencies with our own production transmitters. The sync function changes the radio frequency while keeping the artist's audio gain structure untouched. We typically change several frequencies per day throughout the event, so the ability to change RF without affecting audio is a must." Other Shure microphones were also in evidence throughout the evening. During the tribute to Dolly Parton, Jennifer Nettles and members of Pentatonix sang on UR2/KSM9 transmitters. Another Pentatonix member opted for the huge sweet spot and natural response of the KSM8 Dualdyne™ mic element, as did two members of Vocal Group of the Year Little Big Town for their performance. Florida Georgia Line performed on their custom chrome UR2/Beta 58 transmitters. Best New Artist winner Maren Morris started her performance with the retro-modern look of the Super 55 before switching to her gold UR2 wireless with SM58. In fact, the recurring microphone theme throughout the CMA Awards performances was the classic excellence of the SM58. Broadcast production mixer J. Mark King commented, "It's only fitting that the SM58, which is also celebrating its 50th anniversary this year, is so well represented on the 50th CMA Awards. It remains my first choice for vocal microphones. Its consistency and versatility are timeless."